Lately, I have been making an effort to read more diversely and to read more #ownvoices books, because of that, you will see a few review of #ownvoices books in the coming days, which is so exciting and it makes me so happy. 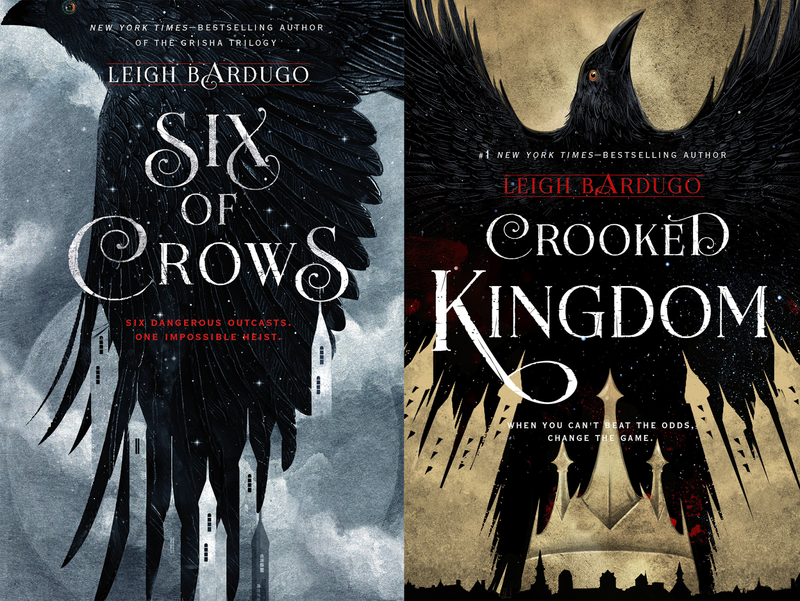 Here’s the review for the Six of Crows series by Leigh Bardugo. – I loved how diverse the cast of these series was. There were POCs, a disable character and LGBTQ+ characters. Also, I want to make a note that this book is a #ownvoices book since Leigh Bardugo has talked about having Osteonecrosis and she even mentioned it in the acknowledgments of Crooked Kingdom and the symptoms are similar to the ones Kaz goes through in the book. –Each character had a distinctive voice and personality, each character had qualities and skills that made them necessary for the plot, but also, they had flaws that made them a danger to themselves and the others. –All the characters developed throughout the series and none was left stuck being who they were at the beginning. Each character had a lot of things that they needed to work on, but each character had one specific journey that they needed to take and it was amazing to see each character be brave enough to go on that journey during the series and see them change and grow. -Also, the dynamic between the characters was one of the most interesting parts of these books. There was tension and disagreements, but there was also appreciation of the qualities and abilities each one of them brought to the group and to the plans they were trying to accomplish. The relationships between all the characters changed throughout the series and they became these very complex and sometimes fragile friendships, but even when they were fragile they were there and these characters were bound together thanks to all the things that they went through. –THE SHIPS WERE GLORIOUS! I specially loved Jasper and Waylan (my favorite scene in the entire series and I’m not even kidding was between them in Six of Crows). Also, I loved Kaz and Inej. I wish Inej had been a tiny bit more understanding with Kaz because he obviously has a trauma, BUT that was handled well at the end and I loved the ending Leigh Bardugo wrote for them because it was so realistic. Mathias and Nina were just alright for me and I liked them a lot better in the second book than in the first. -I enjoyed getting to know the grisha world better and I really liked the fact that the world became more complex because it wasn’t only about Ravka, it was about all these other countries as well. I think that the fact that Leigh Bardugo expanded the world so much, made it possible to see that an action may seem justifiable from the perspective of one country but not another, and there can be different version of the same history depending on the perspective. I honestly don’t know what to tell you. I obviously didn’t like everything because I gave Six of Crows 4,3 stars and Crooked Kingdom 4 stars. But I didn’t lower the rating for some big issue or for something specific. There were little things that I don’t remember that well now that I’m writing the review (I read the book like one week ago), so I don’t think they were that important. The only thing I would mention is the fact that I didn’t care about the plot that much (I just noticed that I didn’t say anything about it in this review). There was nothing wrong with it, it’s just that I was reading for the characters, the relationships between them and the ships. Definitely not for the plot. Have you read this series? Did you enjoy it? What #OwnVoices books have you read and loved lately?